CosmoBC.com » HomeBlog » Roof » Are Flat Or Pitched Roofs Better For Extensions? Naturally, a family’s first house can’t grow at the same rate that a family increases. Homeowners need to intentionally seek to build the corresponding space for additional family members and create more room to fit their needs. Once a family has made a house their home and fallen in love with the neighbourhood, then the idea of moving to a new house is no longer an option. Contractors only need the specific details of their client’s desires and they can make blueprints and build as much space as a family needs. Families should have their home surveyed to ensure the work they have done doesn’t uncover any drastic issues. This could include structural problems like rot, subsidence, or insulation issues. When adding extra space to a house, all design aspects need to be taken into consideration. Building materials, windows, and roofing need to be decided upon before building can start. But what type of roof is best to choose for an extension? The notion of flat roofs being completely flat is a common misconception. Flat roofs are actually built at a slight angle of just a few degrees to handle downpours better and prevent the pooling of water on a completely flat surface. Some flat roofs are built seemingly flat but with slight pitches to also avoid the pooling of water. 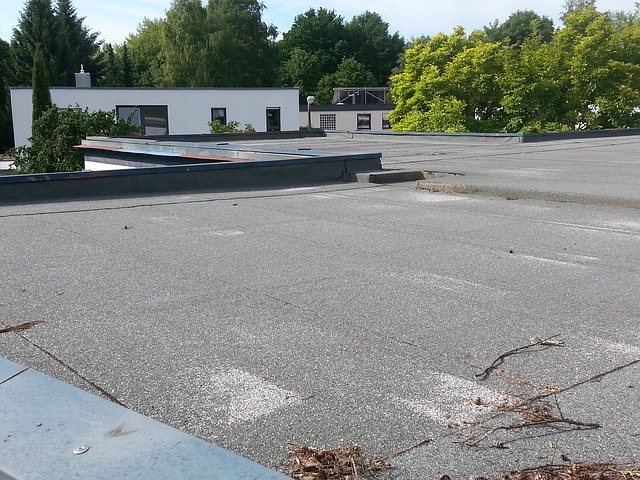 Flat roofs are usually built using asphalt or a form of bitumen then a thin layer of stone chippings or gravel is used to protect the roof from the rays of the sun. Recent innovations have heralded the use of PVC membranes which can be used as a final layer for flat roofs. Alternatively, rubber membranes are also being used for the extra protection of flat roofs. High tech membrane roofing even offers a lifetime guarantee for their flat roofs. Over the years flat roofs have become increasingly popular due to their affordability and effectiveness. It has become a go-to solution for completing small house extension projects. Flat roofs have also been extremely popular in the design of more modern homes. Here are some of the reasons for the booming popularity of flat roofs. Since homeowners do not need to spend on extra support beams, roof shingles and on various materials required to support a pitched roof, the cost for a flat roof is significantly less than a pitched roof. Since a flat roof is mostly just a slab of concrete with extra insulation on the inner and outer layers, the labour cost for such a project is also considerably less than a pitched roof. People are under the impression that flat roofs are more prone to wear and tear than pitched roofs. That might have been true in the past, but that’s just not the case anymore. Because of the continued research and development by various roofing companies in their quest to build durable, long-lasting flat roof solutions for homes, extensions and structures; newer flat roofs can compete with the durability of pitched roofs. There are PVC membranes that can be applied as a top coat as extra armour for flat roofs now. Rubber membranes are also used similarly as an extra layer to shield the materials used in the construction of the flat roof from the elements lengthening the lifespan of the roof. If homeowners don’t want their house extension, garage or new structure to stick out then choosing a flat roof is the way to go. It still looks good but does not command the same presence that pitched roofs do. This fact can be a positive or a negative depending on the needs of the homeowners. Some property owners do not want the extra attention of their large house is visible to the entire neighbourhood, it can attract the wrong kind of attention. Having a large space but keeping a low profile will provide the family with all the extra space they need minus the unwanted attention of thieves. Going with a flat roof is the best option if there is a limited amount of space to work with. Meaning if there are second storey windows that would be covered if the extension is finished in a pitched roof, then a flat roof would be an excellent solution to that dilemma. A flat roof is also a great option to save time and space when building small structures like extra rooms, garages, patios or porches. The flat roof can also be designed as an extra recreational space to serve as a roof deck to enjoy the sun and bask in its glory. There are additional support structures that need to be incorporated to hold that extra weight. It is essential that the proper adjustments to the foundation are completed to avoid any structural problems to the property. It would be a great idea if the home is by the beach or someplace similar where the family can enjoy the outside. On a similar note, try something different by installing artificial grass on the flat roof would make for a great place for the family to hold picnics and stargaze at night. Artificial turf on a flat roof will look ultra unique in the backdrop of the new addition to the home. There is little to no maintenance in taking care of artificial grass and it will even help insulate the new extension even further. Since the construction of flat roofs requires less engineering and considerably fewer materials, the amount of time it takes to build a flat roof is significantly less than a pitched roof. Because of unforeseen problems that cause delays, construction projects sometimes tend to take longer than the initial estimate. Choosing to have a flat roof built will lessen these scenarios and allow for the construction to be completed promptly. While flat roofs have many benefits, there are some drawbacks to this type of finish as well. This would entirely depend on the materials used for the construction of the flat roof. The old method of construction did not include PVC or rubber membranes. With proper care and maintenance, since they were still made of concrete and asphalt, they are still durable enough to last a couple of decades. In case there is little to no maintenance, just like anything else, it will deteriorate over time. Flat roofs do not boast any extra space between the ceiling of the room extension and the roof structure itself. There is some wiggle room for the inner and outer insulation materials, but that would be it. Flat roofs only serve the function of protecting the new structure unless it was designed for something else. The classic design of a pitched roof will fit nicely with more homes that have a traditional style. Needless to say, the sloping angles of pitch roofs allow rainwater to smoothly flow into rain gutters, effortlessly protecting the primary structure of the home. Pitched roofs are designed with two slopes that meet at the top to form a triangle shape. Some joists serve as the skeleton for the structure of the roof itself which can be made using various materials. From the old method of using galvanized iron sheets to clay and ceramic tiles, timber and bitumen felt shingles many different options will fit any budget when building a pitched roof. The timeless beauty of pitched roofs make the extension look like part of the original house and not just a new structure. There are some advantages in deciding to go with a pitched roof for your extension or new room addition. The fact that pitched roofs are built at a sloped angle allows for a loft or attic to form in the triangle area of the roof. Depending on how large space is between the extensions ceiling and the roof structure itself, homeowners can choose to build another extra room in that space or use it as an attic for storage. They can even have the roof designed to fit their needs. They can easily have the contractor create more space for a loft or an attic. The traditional design of a pitched roof has a timeless appeal that will continue throughout the history of the human race. The grandeur of a pitched roof is a favourite of homeowners that want to stand out and make a statement. The overall budget when constructing a pitched roof is significantly more than a flat roof which then supports the valid claim that pitched roofs are sturdier than the alternative. The durable material used in pitched roofs have a long, proven track record with property owners and have been the preference of homeowners in the past decades. However, there have been many breakthroughs for materials that are used in flat roofs so this old belief is now up for debate. Pitched roofs are not perfect and do have their own set of drawbacks as well. Because of the sheer size of pitched roofs, a lot more financial resources are required to purchase materials to complete a pitched roof project. Support beam, cement, rebar, wood, more insulation material, roofing materials and so on. Not to mention the labour costs in hiring contractors to complete the project, it can become quite expensive indeed. Since there is a lot of materials required to build a pitched roof, the contractors would need to make the appropriate adjustments to the foundations of the extension as well. Which again will come at an extra cost to the homeowner. In case the local area has restrictions in the allowed height of structures in the neighbourhood then the homeowners desired design for a loft or adequate attic may not come to pass. When securing building permits, make sure to check with the local government what is the allowed maximum height for pitched roofs. Homeowners that need to build extensions to their home have two marvellous options on how to add the finishing touch to their project. The question of which one is better, a flat or pitched roof can only be answered by the homeowners themselves. Take their needs into consideration, their purpose and budget for the structure and they should be able to come to that answer that will be the best for their family.